Summer Roundup is now full. Please fill out this form to be put on the wait list. Summer Roundup is an all-volunteer run camp that will take place for the 33rd year in 2019. 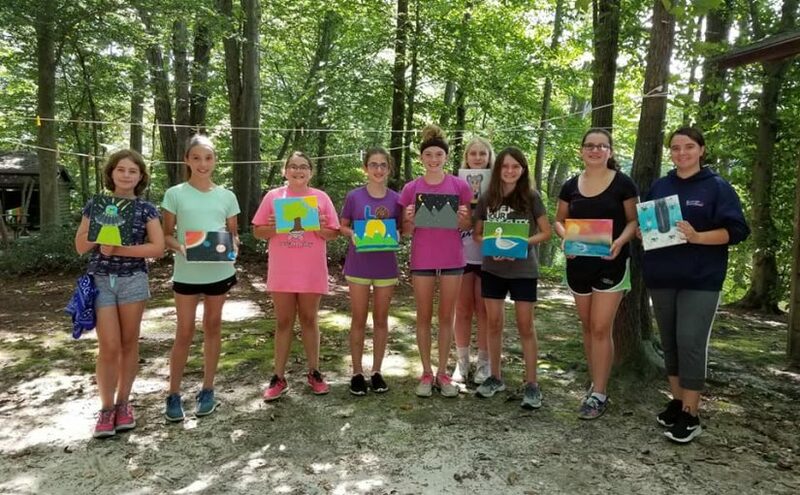 Held at Camp Todd, on the shores of Lake Williston in Denton, Maryland, Summer Roundup takes advantage of the many resources in and around the camp and offers camp activities such as swimming, boating, hiking, wall climbing, archery, zip lining, and more. Girls will engage in programs ranging from digital photography to horseback riding, crafts, and indoor and outdoor cooking. The volunteers at Summer Roundup are certified to lead their programs and strive to provide the best camp experience ever. Campers all earn patches and sometimes earn retired Girl Scout patches such as the Paddle, Pole, and Roll IP or the Make it, Eat Try It. Come join the fun! Fun with Moana This Program is now full – We will travel all the way to Polynesia for crafts, games, costumes, and lots of fun! Wearing our flower leis, we will bowl with kakamora coconuts, make an ocean in a bottle, design our own fish hooks like Maui’s, go on adventures, and lots more. Moana, the movie, is all about history, geology, science, and culture. This program will bring all of those things together with as much fun and energy as Moana herself. Brownie Ribbon Art This Program is now full – You will learn how to make fun projects using ribbon. These projects will include items that you can wear, decorate, and even use as holiday decorations. We will bring together ribbons, beads, and some simple sewing to create a variety of projects. Sewing for Scouts This Program is now full – Sewing for Scouts will celebrate 10 years of sewing programs at Summer Roundup. We will revisit some projects that were loved in the past and do a variety of new sewing projects that all relate to scouting and camping/hiking. Lots of projects and a great community service project as well. Running, Hiking, and Fitness Fun This Program is now full – A highly interactive and energetic week, where we will practice goal setting and team building skills, while learning about fitness and nutrition and identifying ways to encourage ourselves and others. Robotics This Program is now full – Hands-on fun! We will learn how robots work, discover the robot brain, and code a robot to perform a challenge. Camp Sampler: All Your Favorite Camp Activities in One Week This Program is now full – You will spend your days paddling on the lake, doing archery, climbing the high ropes course, tackling the ninja course, and going on hikes. It’s all the adventure you ever wanted at camp rolled into one great experience. So, You Think You Can Cook International Cuisine? This Program is now full – Come one, come all, spin the wheel of cuisine to see what country we will be visiting each day. We will make and enjoy delicious food from 4 different countries and learn a little bit about each country as well. Vinyl Mania This Program is now full – We will have fun learning how to use different techniques using both permanent and heat transfer vinyl. Once we have that conquered, we will be designing and assembling our creations (bring a t-shirt, the color and style of your choice, to decorate). Welcome to Hogwarts This Program is now full – Spend a week at Hogwarts School of Witchcraft and Wizardry. Attend flying lessons, potions class, herbology, astronomy, and more along side the best and brightest wizards of your time. SUMMER ROUNDUP LEADERSHIP ACADEMY: Girls interested in becoming Roundup Camp Aides will get hands on experience working in all areas of camp in addition to earning certifications in Program Aide Training, Camp Emergency Preparedness, and more. Applications are available Sept 1 and due Nov 1. Girls are notified before Dec 1. A separate registration form will be sent to girls accepted into the program. Cost is $195 per girl and includes all meals, snacks, camp t-shirt, program supplies, craft projects, and length of stay. For more details, please see the Camp Details Page.